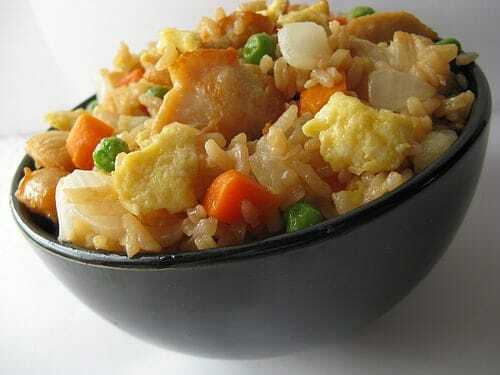 Chicken Fried Rice is so delish, no matter where you have it. But it’s usually pretty greasy and carbohydrate heavy, and could end up costing you a lot of Weight Watcher Points. But this super awesome, low calorie Chicken Fried Rice Recipe not only boasts just 4 Weight Watchers Points per serving, but it tastes DELICIOUS!! Better than some of the fast food fried rice I’ve had! Plus, it’s so fast and easy to make, so if you need a quick side dish recipe to have on the table in minutes, this dish will work great! You can make it as is, or toss in any leftover vegetables you have on hand and bulk it up without adding any extra Points. The next time you are preparing a Chinese food dinner designed with Weight Watchers Recipes in mind, this healthy fried rice recipe will make a perfect addition. It’s loaded with fiber and vitamins, so not only will it keep you from using up all your Points, it’s actually quite good for you too! A tasty and healthy knockoff of the Chinese fast food version, this amazing Chicken Fried Recipe has just 4 Points per serving. Coat a large nonstick skillet with cooking spray and set pan over medium-high heat. Add egg whites and cook, until scrambled, stirring frequently, about 3 to 5 minutes; remove from pan and set aside. Add sesame oil into pan and place back over medium-high heat. Add scallions and garlic; sauté 2 minutes. Add chicken and carrots and peas; saute until chicken is golden brown and cooked through, about 5 minutes. I made this tonight and it was a winner! Thank you!!! This recipe is fabulous! Thanks for posting. Made this with quinoa today and it was great! 6 points because I used more chicken and quinoa. Hello there! I just came across your website today and I must say this is GREAT!!!. I always wanted to find a website with ww meals from others that have tried them and know the points. I cannot wait to try some of these next week, once I go to the grocery store this weekend. Thank you so much and continue to post those receipes. How many cups does this recipe make? I’m a calorie counter and can figure the calories per serving if I knew the total number of servings this makes. Total recipe makes about 6 scant cups. how many grams is in one cup? I just made this recipe and it was awesome!!! In case anyone was wondering it does equal 4 points plus! Delicious! Such a tasty, filling and overall satisfying dish! I'm guessing the points plus would be higher seeing that brown rice is 5 points a cup. For the amount of peas and egg whites you'd actually have in a serving i doubt that would add up to another point. is this the updated value? 3 Points+ for 1 serving – this looks delish and I can't wait to make it! This recipe still shows the old Weight Watchers Points. I have not yet been able to update it with the new Points Plus total. Can I use egg substitute instead of egg whites? Absolutely. Double check the nutritional stats as you build the recipe, but there's not a huge difference in calories between the egg whites and liquid egg substitute, so it shouldn't affect the Points Plus value. Oh, I added 1 egg yolk for color….. I don't know the PointsPlus value for this one yet, as I have to re-make it and recalculate all the nutritional stats. But as soon as I do, I will update the post! But beware that dding the egg yolk will definitely add more fat and calories, thus increasing the PointsPlus value. I am not on the Weight Watchers diet but the 6 Week Body Makeover diet and discovered the site a couple days ago while looking for some recipes that fit into my body blueprint. I just finished making the recipe and have to say this is some of the best chicken stir fry I've ever had, and it's all homemade! I didn't have peas, so I substituted green beans. Used onions instead of scallions, and garlic powder instead of the cloves. Even though I was lacking in ingredients heavy, it still came out very nicely and was so very happy with the results. It was simple and easy and I will most definitely be making it again. How many calories are in a cup of this recipe? Unfortunately I don't have the calories for this recipe….just the points. Wish I could be more helpful! Hello, LaaLoosh! I can't wait to try this recipe and many of the others you have posted. I just found your site today and am excited about the new recipe ideas! Your Breakfast Sandwich looks great too. I think you and I have the same food cravings! Take care and God bless you for all the work you have put into this site and how it is helping so many people. p.s. Morningstar Farms makes great faux meat products too! I calculated everything out and got 4 points per serving. Just a heads up. Sometimes the Point Total may vary a bit depending on the brand of ingredients that you use. So it's always a good idea to calculate your weight watchers points by the caloric info of the ingredients that you use. That way, you are guaranteed to get the correct info for any weight watchers recipe. This was delicious! Thank you for sharing. My husband, five year old and two year old all really liked it too. A definite keeper. Wouldn't the point value be different for the recipe if made with brown rice as opposed to white rice? It might. But it depends on the Points value of the rice that you use. This recipe calls for brown rice. If you make it with white rice instead, you will have to recalculate the total Points value for the recipe by adding up all the nutritional stats. Great site! I can't wait to start trying the recipes! I love your site, thank you so much. I tried this fried rice, it was so yummy. My husband and sons loved it too. Will make again soon. I am slightly confused about the other comments. Do the points values differ by "plans" I'm doing the momentum plan? What would the point value be? Thanks in advance. I'm so glad to hear that you like the recipes! The comments that you see are related to the different types of plans that Weight Watchers offers. If you are following the Core Plan, then primarily, you don't count Points…you just eat any amount you want of the Core Foods (in a nutshell). If you are following the Flex Plan, then you DO count Points, and the total Weight Watchers Points for a serving of this recipe (3 Points) is counted towards your Daily Points Range. With the Weight Watchers Momentum Plan, you will still count Points the same as the Flex Plan. The Points may vary depending on which Weight Watchers Plan you follow. I follow the Flex Plan, so I base all my calculations on that. If you are following the Core Plan, you may have to re-work the Point Values for the ingredients that are not counted towards your Points. So based on the Core Plan, this is a great Core Plan Recipe because it basically has no Points to account for!! As for the cooking spray, it can count as 0 Points as the amount of oil in the few sprays that are used is not enough to amount to the calories needed to count it as a Weight Watcher Point. Hi! I just discovered your site yesterday…thank you for the recipes! I made the chicken fried rice tonight, it's so yummy!